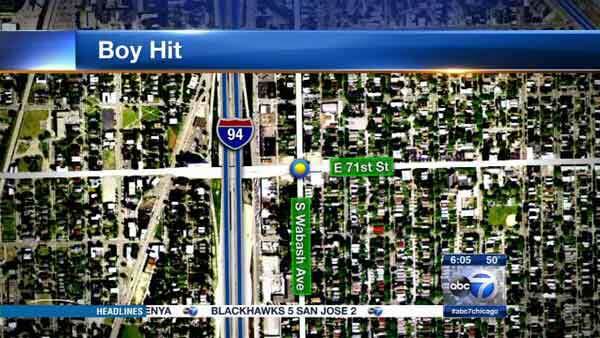 A three-year-old boy was critically injured after being struck by a car in Chicago's Park Manor neighborhood. CHICAGO (WLS) -- A three-year-old boy was critically injured after being struck by a car in Chicago's Park Manor neighborhood. Police said the boy was holding a relative's hand in the 7100-block of South Wabash Avenue, when he broke free and ran into traffic around 1:45 p.m. Wednesday. The boy was rushed to University of Chicago Comer Children's Hospital, where he is listed in critical condition. The driver stopped and was cited for hitting a pedestrian in the roadway.